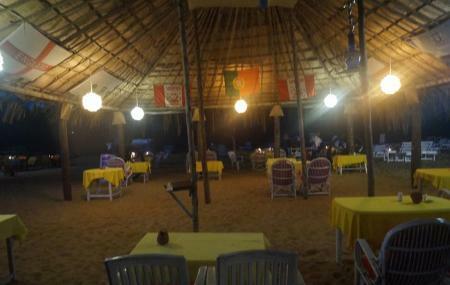 Find hotel near Jolly Jack Shack & Water ..
Jolly Jack Shack & Water Sports is a good place to hangout at the Calangute beach in Goa, India. Sit under the shack and enjoy the seaview while having a drink. The place serves tasty snacks and beverages. The music played during night makes the atmosphere pleasant in the shack. You can also make the most of your time here by enjoying the water sports offered by them. Consider visiting this shack when you are at the Calangute beach in Goa. Want to plan a DIY trip? Use Calangute trip planner for the same. You can enjoy a comfortable stay in the city by booking the best hotels in Calangute like Treebo Jesant Valley Holiday Homes, Eros Boutique Hotel, Treebo Santiago Beach Resort and Resort Coqueiral. Love this? Explore the entire list of places to visit in Calangute before you plan your trip. Fancy a good night's sleep after a tiring day? Check out where to stay in Calangute and book an accommodation of your choice. Very good place. People there are very polite. I'm truly satisfied by their services. Food is expensive.. limited options on veg foods. Not so great taste can eat. Rides are very very expensive 1000 to 1500 just boat ride for 10 mins they say 15 to 20 mins but u can expect less than that. U have fishing , flying in the parachute,boat ride, some island visit and dolphin sight till 11am only all this are very very expensive. But u can have a romantic candle light dinner on the beach in the night . It's awesome. Definitely do spend min 4 days to see some places and enjoy there.